On Monday, the Department of Cultural Resources Underwater Archeology team performed their last dive of the season to recover artifacts from Blackbeard's flagship the Queen Anne's Revenge, and it was a huge success. Five cannons and two large concretions were brought up from the bottom of the ocean floor, making it the largest one day recover of cannons so far. Public Radio East's Mac McKee spoke with Director of the State Office of Underwater Archeology Steve Claggett about the dive. We travel to the wreck site of the pirate Blackbeard’s flagship “The Queen Anne’s Revenge.” It’s an audio postcard from Beaufort Inlet as we witness five thousand pounds of weaponry being raised from its watery grave. Plus, we speak with experts about the recovery project, which is 16 years in the making. The treacherous waters along coast of North Carolina are known around the world as the graveyard of the Atlantic. Thousands of ships have run around on the shifting shoals, from sixteenth century exploration vessels to German U-boats that sank during World War II. One of the most famous wrecks is that of the infamous pirate Blackbeard. His flagship the “Queen Anne’s Revenge” sank in 1718 near Beaufort inlet. Since its discovery in 1996, artifacts from the site have been recovered and preserved. Last Thursday, divers with the North Carolina Department of Cultural Resources Underwater Archeology Division brought up a pair of 300 year old cannons from the site, about a mile off Fort Macon. It is a clear, sunny day by the docks at The Boathouse at Front Street Village in Beaufort as the crew of the “Crystal Coast Lady” prepare for our trip to the wreck site. We won’t be involved in the recovery, but we’d be watching from a safe distance. An attempt to raise the cannons was made June 12th, but was called off because of low water visibility and unfavorable weather conditions. But today’s forecast looks promising. After a briefing on the history of Blackbeard, approximately 80 people, including Department of Cultural Resources staff, Queen Anne’s Revenge experts, members of the Friends of Queen Anne’s Revenge and guests start boarding the waiting vessel. We make our way down Taylor’s Creek along the Beaufort waterfront, past Radio Island, before making a left and heading through Beaufort inlet. Along the way, retired underwater archeologist and our guide for today’s trip Mark Wilde Ramsing points out a dredging platform just a couple hundred yards off the port side. The Dan Moore is assisting in the cannon recovery. The 85 foot ocean going research vessel belongs to Cape Fear Community College. It’s almost 50 years old and has made over 400 research trips. Since the site of the Queen Anne’s Revenge is only about a mile off the coast, the shoreline can be easily seen. As we move into position, parallel to the vessel Dan Moore, the American flag flying above Fort Macon is just barely visible off our bow. Directly above the wreck site, another smaller, barge like vessel named “Jones Bay” is anchored. To bring the cannon to the surface, divers attach a “lift bag” to the canvas strap secured around the cannon. The water is only about 25 feet deep at the wreck site so it doesn’t take long for the cannon to float to the surface. About five minutes pass, and then, the yellow lift bag breaks the surface of the water. On the deck of the Dan Moore, a team of students with Cape Fear Community College’s Marine Technology program begin tugging at a red rope connected to the cannon and the divers about 150 feet away. Onlookers watch nervously as the divers are tossed around by the wind and waves. Then, the red rope gets tangled around the Dan Moore’s mooring line. Another tense five minutes pass and finally the red rope is free from the mooring line. The lift bag, cannon and divers continue to be hauled in until they are finally float beside the Dan Moore. This is where the third phase of the lifting process begins. The expert divers with the Department of Cultural Resource’s Underwater Archeology division work quickly to connect the vessel’s crane hook to the canvas strap around the cannon. Then, the signal is given to lift the bag from the water. We watch and wait several more minutes as the crane reels it in. And for the first time in almost 300 years, the cannon breaks the surface of the water. Even though the three century old artifact is covered in concretion, it’s very easy to tell that it’s a cannon. As it’s slowly lifted out of the water, the crew aboard the Dan Moore lean over the side of the boat to stabilize the cannon and keep it from swinging. Other crew members set up a cinder block and two by four platform for the cannon to rest on. Then the cannon is gently lowered as onlookers watch intently. 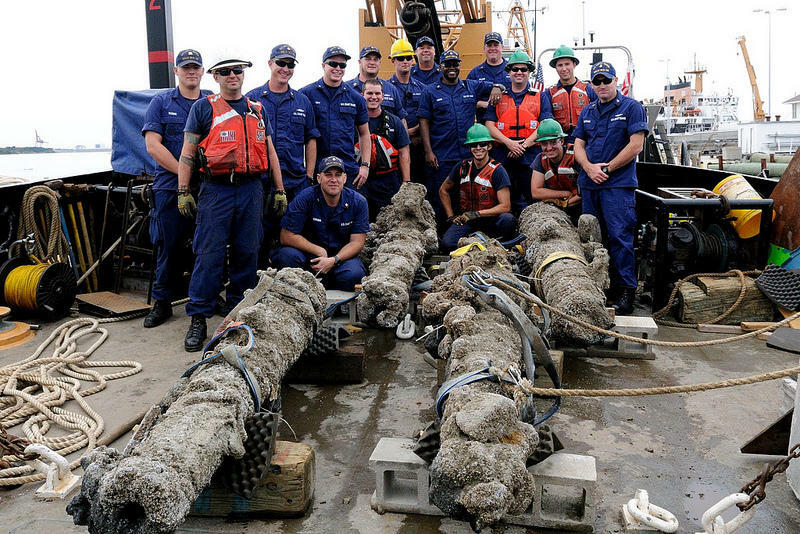 The Department of Cultural Resources Underwater Archeology Division had a goal of lifting three cannons during last Thursday’s offshore excursion. However, they were only able to lift two. As the divers and underwater archeology celebrate their successful lift, Queen Anne’s Revenge Conservation Lab Director and Chief Conservator Sarah Watkins-Kenney’s work is just beginning. She says the cannons will be taken to the Queen Anne’s Revenge Lab at East Carolina University in Greenville, where they will remove the concretion and prepare them for exhibition. So far, about 280-thousand items, including the ship’s bell, straight pins, gold flakes, lead shot, bottles, and guns have been recovered from the wreck. One of the three thousand pound anchors – more than 11 feet long and 7 feet across – was brought up in 2011. It’s currently soaking in a huge vat at the Queen Anne’s Revenge Lab where it will stay for a few more years. The conservation of artifacts from the wreck site has been ongoing for 16 years. In order to keep the program going, Chief Deputy Secretary with the Department of Cultural Resources Karen Cochran says they’ve had to shift funding sources. "years ago, when this was first discovered, the state was heavily involved in funding but over time, as you can imagine, funding to support something like this endeavor is going to need some private support. This is a partnership like we have in a lot of our areas within the Dept. of Cultural Resources that we have a partnership with private supporters and public funding to make something like this happen. The Friends of the Queen Anne’s Revenge is a private, not-for-profit group that supports the work of the state of North Carolina on the recovery of the wreck of Blackbeard's flagship. Richard Lawrence is President of the Friends of Queen Anne’s Revenge and the former Deputy State Underwater Archeologist for the Department of Cultural Resources. He says the site and the artifacts are a part of North Carolina history and need to be preserved. To learn more about Blackbeard and his ties to North Carolina, you can visit the North Carolina Maritime Museum in Beaufort. On display is a model of the underwater wreck site and the ship's bell.